Dan Severn was an All American at Arizona State University in Wrestling. Dan Severn placed 5th as a sophomore 190 1979 and 4th as a senior 1981. November 25, 1992 – UWF-I: Dan Severn defeated Yuko Miyato. December 20, 1992 – UWF-I: Dan Severn defeated Yoji Anjo. January 10, 1993 – UWF-I: Dan Severn defeated Kiyoshi Tamura. February 14, 1993 – UWF-I: Dan Severn defeated Yoji Anjo. April 10, 1993 – UWF-I: Dan Severn defeated Kiyoshi Tamura. May 6, 1993 – UWF-I: Nobuhiko Takada defeated Dan Severn. August 13, 1993 – UWF-I: Dan Severn and Gary Albright defeated Kiyoshi Tamura and Nobuhiko Takada. October 4, 1993 – UWF-I: Salman Hashimikov and Vladimir Berkovich defeated Dan Severn and Gary Albright. December 5, 1993 – UWF-I: Salman Hashimikov and Vladimir Berkovich defeated Dan Severn and Gary Albright. January 28, 1994 – All American Pro Wrestling: Dan Severn defeated Shinobi. January 29, 1994 – AAPW: Dan Severn defeated Al Snow. February 25, 1994 – UWF-I: Naoki Sano and Nobuhiko Takada defeated Dan Severn and Gary Albright. April 3, 1994 – UWF-I: Masahito Kakihara defeated Dan Severn in the 1st round of the Best in the World tournament. May 6, 1994 – UWF-I: Hiromitsu Kanehara and Yoshihiro Takayama defeated Billy Scott and Dan Severn. 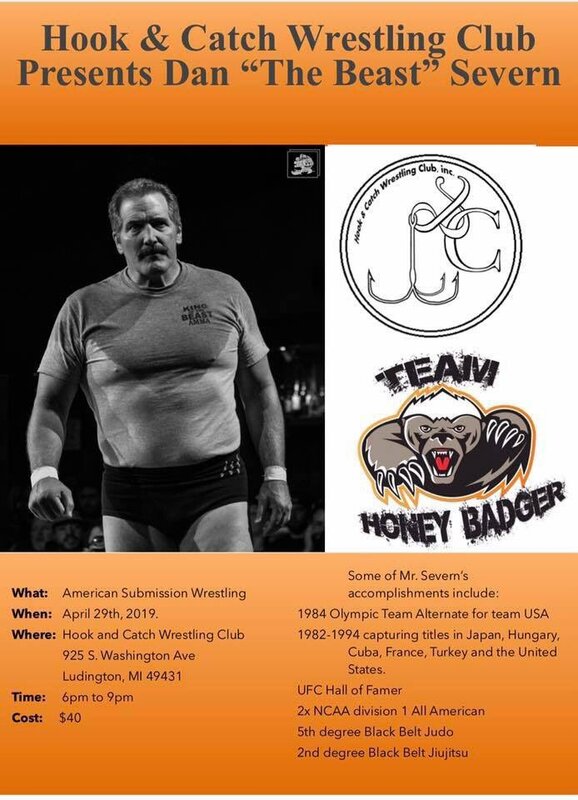 August 26-27, 1994 – BCW: Dan Severn defeated The Kodiak. October 8, 1994 – UWF-I: Dan Severn and Kiyoshi Tamura defeated Steve Nelson and Yoji Anjo. October 14, 1994 – UWF-I: Dan Severn defeated Yoshihiro Takayama. November 30, 1994 – UWF-I: Kiyoshi Tamura defeated Dan Severn. January 6, 1995 – NWA Sabu: Dan Severn defeated Johnny Johnson in a wrestler vs boxer match. February 18, 1995 – MTW: Bruiser Beldam vs. Dan Severn ended in a no contest to retain the heavyweight title. February 24, 1995 – SMW: Dan Severn defeated Chris Candido to win the NWA world heavyweight title. March 17, 1995 – SCW: GAME strong style champion & NWA world heavyweight champion Dan Severn defeated Benson Lee to retain the titles. March 18, 1995 – SCW: Dan Severn and Ray Roberts defeated Brian Rollins and Rik Matrix in a Texas tornado tag team match. March 19, 1995 – SCW: Dan Severn defeated Benson Lee to retain the NWA world heavyweight title. March 25, 1995 – NWA New Jersey: Dan Severn defeated Osamu Nishimura to retain the NWA world heavyweight title. April 7, 1995: NWA World title holder Dan Severn won the Ultimate Fighting Championship V.
~~~Dan Severn proved to the world that the skills of professional wrestlers are very real. April 22, 1995 – NWA New Jersey: Dan Severn defeated Tommy Cairo to retain the NWA world heavyweight title. April 23, 1995 – MEWF: Dan Severn defeated Tommy Cairo to retain the NWA world heavyweight title. May 20, 1995 – SMW: Dan Severn defeated Bobby Blaze to retain the NWA world heavyweight title. May 26, 1995 – BCW: Dan Severn defeated Tony Brooks. June 3, 1995 – NWA New Jersey: Dan Severn defeated Tommy Cairo to retain the NWA world heavyweight title. July 29, 1995 – NWA New Jersey: Dan Severn defeated Andre Baker to retain the NWA world heavyweight title. August 4, 1995 – SMW: Dan Severn defeated Bobby Blaze to retain the NWA world heavyweight title. August 20, 1995 – IWA Japan: Dan Severn defeated Tarzan Goto to retain the NWA world heavyweight title. August 26, 1995 – SCW: Dan Severn defeated Tony Monroe to retain the GAME heavyweight title. Dan Severn defeated Geza Kalman Jr. to retain the GAME Strong Style heavyweight title. October 28, 1995 – NWA New Jersey: Dan Severn defeated Jim Neidhart to retain the NWA world heavyweight title. February 3, 1996 – NWA Eddie Gilbert Memorial Brawl: Dan Severn defeated Al Snow to retain the NWA world heavyweight title. March 5, 1996 – NWA: Dan Severn defeated Repo Man to retain the NWA world heavyweight title. March 6, 1996 – NWA: Dan Severn defeated Jim Neidhart to retain the NWA world heavyweight title. March 30, 1996 – NWA New Jersey: Dan Severn defeated The Ghetto Blaster to retain the NWA world heavyweight title. June 1, 1996 – World Wrestling Peace Festival: Antonio Inoki and Dan Severn defeated Oleg Taktarov and Yoshiaki Fujiwara. June 14, 1996 – NWA New Jersey: Dan Severn defeated The Ghetto Blaster to retain the NWA world heavyweight title. August 2, 1996 – NJPW: Dan Severn defeated Yoshiaki Fujiwara. August 16, 1996 – BCW: Dan Severn defeated Geza Kalman Jr. to retain the NWA world heavyweight title. February 22, 1997 – NWA New Jersey: Dan Severn vs. Dory Funk Jr. ended in a time limit draw to retain the NWA world heavyweight title. March 8, 1997 – NWA New Jersey: Dan Severn defeated Harley Lewis to retain the NWA world heavyweight title. March 28, 1997 – NWC: NWC heavyweight champion Sabu vs. Dan Severn ended in a no contest to retain the title. April 12, 1997 – NWA 2nd Annual Eddie Gilbert Memorial Brawl: Dan Severn vs. Dory Funk Jr. ended in a double count-out to retain the NWA world heavyweight title. April 26, 1997 – NWA New Jersey: Dan Severn defeated Jimmy Cicero to retain the NWA world heavyweight title. May 4, 1997 – Outaia Pro Wrestling: Dan Severn defeated Geza Kalman Jr. to retain the NWA world heavyweight title. May 16, 1997 – CWF: Dan Severn defeated Johnny Paradise to retain the NWA world heavyweight title. May 24, 1997 – NWC: Bam Bam Bigelow defeated Dan Severn by DQ. February 28, 1998 – NWA 3rd Annual Eddie Gilbert Memorial Brawl: Dan Severn defeated Franz Schuhmann to retain the NWA world heavyweight title. March 30, 1998 – RAW: Dan Severn (w/NWA belt) made his RAW debut with manager James E. Cornette. April 6, 1998 – RAW: Dan Severn defeated Flash Funk. April 20, 1998 – RAW: Dan Severn defeated Headbanger Mosh. May 4, 1998 – RAW: Dan Severn defeated Savio Vega. May 8, 1998 – NWA Southwest: Dan Severn defeated Rod Price to retain the NWA world heavyweight title. May 25, 1998 – RAW: Dan Severn defeated Owen Hart by disqualification. June 8, 1998 – RAW: Dan Severn defeated D’Lo Brown to qualify for the King of the Ring tournament. June 15, 1998 – RAW: The Nation (Owen Hart and Mark Henry) defeated Dan Severn and Ken Shamrock by disqualification. June 22, 1998 – RAW: Dan Severn defeated Owen Hart in the 1st round of the King of the Ring tournament. June 26, 1998 – NWA Championship Wrestling America: Dan Severn defeated Lance Diamond to retain the heavyweight title. June 27, 1998 – NWA Championship Wrestling America: Dan Severn defeated Doug Gilbert to retain the heavyweight title. June 28, 1998 – King of the Ring: The Rock defeated Dan Severn in the semi-finals. July 11, 1998 – Shotgun Saturday Night: Dan Severn defeated GI Will. July 13, 1998 – RAW: Dan Severn defeated Kama in the 1st round of the Brawl 4 All Tournament. July 17, 1998 – ECCW: Dan Severn defeated Doink The Clown to retain the NWA world heavyweight title. July 18, 1998 – ECCW: Dan Severn defeated Mike Roselli to retain the NWA world heavyweight title. July 26, 1998 – Fully Loaded: Owen Hart defeated Ken Shamrock in a Dungeon Match with referee Dan Severn. July 27, 1998 – RAW: Dan Severn pulled out of the Brawl 4 All Tournament, citing he has nothing left to prove. July 27, 1998 – RAW: Owen Hart defeated Dan Severn by disqualification. August 3, 1998 – RAW: European champion D-Lo Brown defeated Dan Severn by disqualification to retain the title. August 17, 1998 – RAW: Dan Severn defeated Ken Shamrock and Owen Hart in a 3-way match. August 23, 1998 – Sunday Night Heat: Owen Hart and Dan Severn defeated The Head Bangers. August 24, 1998 – RAW: Ken Shamrock defeated Dan Severn via DQ. September 12, 1998 – Shotgun Saturday Night: Dan Severn defeated Jesus Castillo. September 19, 1998 – Shotgun Saturday Night: Dan Severn defeated Robert Thompson. September 28, 1998 – RAW: Owen Hart vs. Dan Severn ended in a no contest. October 23, 1998 – JAPW: Dan Severn vs. King Kong Bundy ended in a no contest. October 24, 1998 – NWA 50th Anniversary Show: Dan Severn defeated Steven Regal to retain the NWA world heavyweight title. November 14, 1998 – APWF: Dan Severn defeated Jimmy Cicero. January 24, 1999 – Royal Rumble: Dan Severn was in the Royal Rumble match won by Mr. McMahon. January 28, 1999 – RAW: Steve Blackman defeated Dan Severn via DQ. March 14, 1999 – UFO: Naoya Ogawa defeated Dan Severn to win the NWA world heavyweight title. May 28, 1999 – NWA Southwest: Naoya Ogawa vs. Dan Severn ended in a double count-out to retain the NWA world heavyweight title. June 29, 1999 – UFO: Dan Severn defeated Justin McCully. May 27, 2000 – Wrestling In Ashwaubenon: Dan Severn defeated Greg Valentine. August 5, 2000 – FWA: Dan Severn defeated Michael Kovac. March 9, 2002 – ZERO-1: Dan Severn defeated Shinya Hashimoto to regain the NWA title at Korakuen Hall in Tokyo (heel ref screw-job finish). April 14, 2002 – CWE: Dan Severn vs. Big Kahuna ended in a no contest to retain the NWA world heavyweight title. July 5, 2002 – NWA Southwest: Hotstuff Hernandez defeated Dan Severn to retain the NWA National heavyweight title. December 21, 2002 – MAW: Dan Severn defeated Adrian Serrano. February 1, 2003 – MMWA: Dan Severn defeated Thurston Skowl III. April 18, 2003 – GCW: Dan Severn defeated The Searcher. July 2003: Dan Severn was inducted into the Hawaii Martial Arts Hall of Fame. July 31, 2003 – BWCW: Dan Severn defeated Matt Longtime. November 9, 2003 – AWE: Dan Severn defeated Donny DiCaprio. August 7, 2005 – Central Wrestling Federation: Dan Severn and Tommy Gage defeated Brad Lamen and Billy Bart. October 8, 2005 – Action Wrestling Entertainment: Dan Severn defeated Kenny Omega in an MMA match. December 5, 2005 – AWE: Dan Severn defeated Kenny Omega. December 6, 2005 – AWE: Dan Severn defeated Donny DiCaprio. December 7, 2005 – AWE: Dan Severn defeated Eddie Watts. February 6, 2006 – NWA-UK: Dan Severn defeated Johnny Moss to win the heavyweight title. February 17, 2006 – NWA-UK: Dan Severn & Zack Sabre Jr. defeated Johnny Moss & Steve Walloski. February 18, 2006 – NWA-UK: Johnny Moss defeated Dan Severn to win the heavyweight title. May 21, 2006 – Price of Glory Wrestling: Jimmy Jacobs and N8 Mattson defeated Josh Abercrombie and Dan Severn. May 25, 2006 – BDW: Nikita Allanov defeated Dan Severn to retain the BDW heavyweight title. November 5, 2006 – Price of Glory: Jimmy Jacobs defeated Dan Severn. May 27, 2007 – PoG: CJ Otis defeated Dan Severn. October 7, 2007 – PoG: Dan Severn defeated Jeff King. August 9, 2008 – JCW: Dan Severn defeated Kris Chambers. November 16, 2008 – Old School Championship Wrestling: Malachi defeated Dan “The Beast” Severn. December 6, 2008- PoG: Dan Severn defeated Keith Creme. June 21, 2009 – POGW: Dan Severn defeated Johnny Dynamo to win the heavyweight title in a career vs. career match. August 9, 2009 – JCW Bloodymania III: Ken Shamrock defeated Jimmy Jacobs w/ Scott D’Amore (Dan Severn was guest referee). March 21, 2010 – POGW: Dan Severn, Dollar, Jack Verville defeated Jimmy Shalwin, Louis Lyndon and Russ Jones. September 3, 2010 – MPW: Dan Severn vs. Phil LaFon ended in a draw. September 10, 2010 – ASW: Dan Severn defeated Nelson Creed. 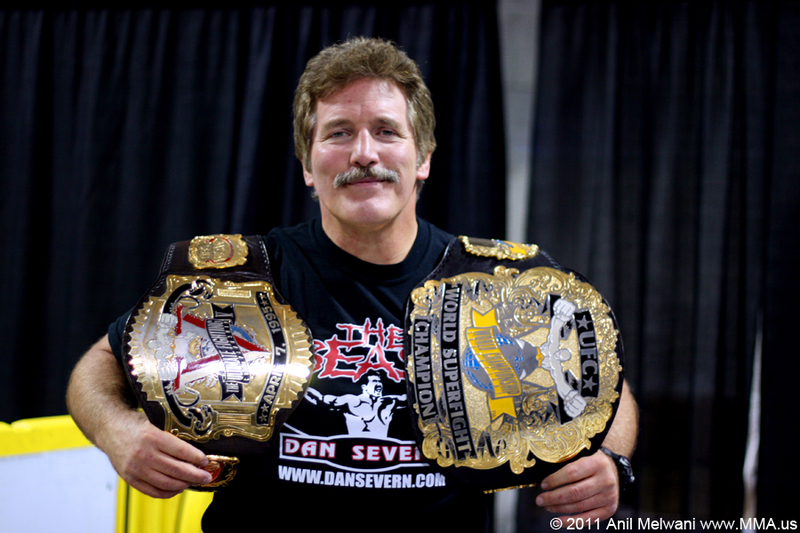 November 8, 2011 – IWA East Coast: Dan Severn defeated Sami Callihan. Sami Callihan defeated Dan Severn. November 16, 2011 – Hiromitsu Kanehara 20th Anniversary: Dan Severn defeated Takaku Fuke. December 23, 2011 – Final Battle: ROH World Champion Davey Richards w/Team Richards defeated Eddie Edwards w/Dan “The Beast” Severn. September 28, 2012 – CCW: The Sons Of Anarchy (Billy Blaze, Cliff Corleone and Mike Mission) defeated Dan Severn, AJ Sanchez and Kevin Chevy. September 29, 2012 – PPW: Bulldog MacBain and The Irishman defeated Dan Severn and Massive Damage to win the tag team titles. May 4, 2013 – POGW: Jack Thriller defeated Dan Severn. September 6, 2013 – TCW: Vordell Walker defeated Dan Severn. October 16, 2013 – PPW: Dan Severn and Stormbringer defeated Gothic Knight and Sydney Steele. September 21, 2014 – CW: Dan Severn defeated Cody Deaner. February 28, 2015 – GNW: GNW Canadian champion Hannibal defeated Dan Severn to retain the title. May 27, 2016 – AIW: Dan Severn defeated Colin Delaney in the 1st round. May 28, 2016 – AIW: Raymond Rowe defeated Dan Severn, Tim Donst and Tracy Williams in a 4-way, semi-finals match. Lets flash to the past. 1994, The Ultimate Fighting Championships have begun pairing two men inside a octagon shape steel cage with only two rules to abide by: 1) Do not bite your opponent and 2) No eye gouging. Anything else you can possibly think of was good to go and I mean anything. There was no weight classes, no time periods and no gloves, only bare knuckle action. Did I forget to say that this was an eight man tournament? You had to fight three different men in one night, thus the era of No Holds-Barred was etched in stone. The titles were different at that time. They did not have specific weight classes, but rather Tournament belts and The Super Fight Title. During this time period I was named as the ONLY Triple Crown Champion Winner. At UFC 5 “Return of The Beast”, I defeated three men to gain the Championship belt that night. I was also the victor at the first “Ultimate Ultimate” in 1996, where I competed against champions and runner ups. The third Championship Belt was the Super Fight Championship when I defeated “The Worlds Most Dangerous Man” Ken Shamrock at UFC 9. Now, let’s flash to the future. The eve of 2006, 12 years after I began my fighting career. Yes, I still enter steel cages (coined politically as Mixed Martial Arts), and I also continue to enter the “squared circle” as a professional wrestler. So at the age of 47, this means I still compete and will continue to compete alongside commitments for MMA seminars, appearances, speaking engagements, etc. all around the world. Competition is what I love and most of the time. it loves me back. I am also the Head Instructor of my “Sports Center” (Michigan Sports Camps) in Coldwater, Michigan. This is a training facility where you can learn MMA, Pro Wrestling, Boxing, Kickboxing, Amateur Wrestling, and more. This is a 10,000 sq. ft. building with two mat rooms, a heavy bag room, full weightlifting room, two rings (16×16 and 20 x20), two dorms that holds up to 40 people at once, a full cafeteria and more. We have an array of students who want to learn what it takes to go to the top in either the fighting world or the pro wrestling business. Some questions, I get asked all the time are. Who starts a fight career at the age of 36? What possessed Dan Severn to start amateur wrestling in the first place? Why was Dan Severn criticized for being a professional wrestler? Learn the truth about me. and about the man they refer to as “The Beast” by signing up for my weekly newsletter. Also, I encourage feedback, so when you happen to read my newsletters and you have questions or comments, please email them to [email protected] Let me know what you want to hear about. I will respond to you ASAP, but I do get hundreds of emails a day, so please be patient. #LionsDen 🦁 match on #SundayNightHeat between #SteveBlackman and #OwenHart ends in a no contest with referee @danbeastsevern interfering.